When I travel, I enjoy visiting open air markets and love to check out the produce and spices. What’s available in the market reflects the food culture and traditions of the country. I also like to get a feeling for the people as they go about their daily shopping. 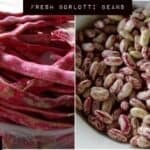 When I was in Italy in the summer time, I became intrigued by these fresh borlotti beans. They were so colorful, and I’d never seen fresh beans in their pod before. When I took a cooking class in Italy, the teacher Alessandra was so kind and incorporated the fresh beans into the menu for me. I love this winning combination of Italian ingredients. The flavors and textures really complement one another. 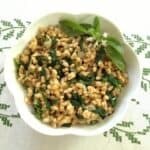 This dish can be served as a side dish or as a vegetarian or vegan main dish.